Addtech Ab is a technological trading company which develops and trades in advanced technology components and systems for industrial companies and the service sector. The Group's annual turnover is around 700 million, with just over 2,200 employees. Addtech's history dates back over a hundred years. Addtech consists of approximately 140 subsidiaries striving for leading positions in selected niches in the market. The subsidiaries are guided by entrepreneurship and technical expertise, focusing mainly in the Northern European markets. The group's customers operate primarily in the manufacturing industry, the processing industry, the automotive industry, telecommunications companies, the electronics industry and healthcare. 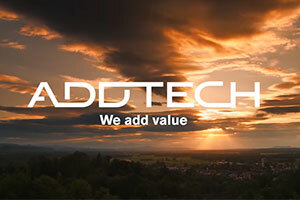 Addtech provides technological and economic added value to its customers. The Addtech group is listed in the Stockholm Stock Exchange in the NASDAQ OMX list.